“Madame Sorgue, syndicalist, 'the most dangerous woman in Europe,' with her Buffalo Bill hat and crimson corsage splashing the congresses of European labour… she was a slashing, picturesque figure, a tall, narrow-hipped, full-busted woman — a real ' angel of the revolution.' ” Desmond Shaw, Labour , The giant with feet of clay. Madame Sorgue, referred to by the police as "Mme. Trouble, Europe's most dangerous woman" and as “The Stormy Petrel” and "La Belle Anarchiste" had an important role in spreading the ideas and methods of French syndicalism throughout Britain, as well as being active on an Europe-wide basis. ‘La citoyenne Sorgue’ as she was known in socialist circles, was from a wealthy background, the grand daughter of the French Antoine Durand and of the Russian general Piotr Chripkov, military attaché to the Russian embassy in Washington, and daughter of the Fourierist doctor Joseph-Pierre Durand de Gros. She had a key role in founding several socialist groups in the department of the Aveyron, where she was brought up (her name Madame Sorgue derives from the name of the river that runs through the department but may also involve an anagram of her surname Gros and sorge, ta German word for trouble)). A gifted orator, she was also a journalist, working first on the daily the Journal des Débats. She married a journalist Auguste Cauvin, another journalist ( who also used a pseudonym-D’Arsac- after the estate owned by the Durand de Gros family) who also had similar ideas to her. In 1884 they attempted to set up a Fourierist colony in Brazil but this turned out to be a total failure and they were forced to return to France after several months. She tried, like her grandfather and father, to put her ideas into practice at Arsac, but again this proved to be a failure and the land had to be sold. Local inhabitants recalled her haranguing the workers of the estate on socialism during their breaks and singing the International. She was known by local peasants as the “femno del diaples ( local dialect for the devil’s woman). 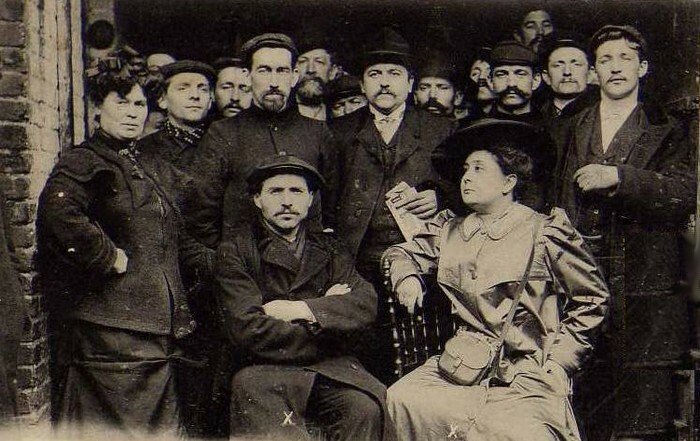 She joined the Blanquist Parti Socialiste Revolutionnaire (PSR) of Edouard Vaillant and represented three of its Aveyron groups at the general socialist congresses of Paris in 1889 and 1900. She took most of the Aveyron groups with her into the Parti Socialiste de France after the Millerand affair (Millerand was a socialist who had joined a non-socialist government). She represented them at the socialist unity congress of Paris in April 1905 which led to the formation of the SFIO (French Section of the Workers International) . She was a delegate to the congress at Nancy in 1907. Here she supported Madeline Pelletier over the right to the vote for women. Pelletier agreed that the working class would gain nothing from the ballot box, but working class women should be accorded the same rights as their male counterparts, having then the choice of rejecting the vote. Sorgue declared : “ I do not believe that woman can emancipate herself by voting slip. I believe that the woman who interests us, which is the proletarian woman, can only emancipate herself through the syndical struggle, that is to say the economic struggle”. She allied herself with the “insurrectionalist” wing of the SFIO around Gustav Hervé, which was strongly anti-electoral, anti-parliamentarian and anti-militarist, and influenced by the ideas of syndicalism and anarchism. In 1905 she supported the strike of textile workers in Limoges where the droit de cuissage ( sexual harassment of women workers by bosses and foremen) was one of the main causes of the strike. It was only she and the anarchists who really highlighted the problems this posed. She praised the courage of the women workers, adding that “Wherever I go, in the North, in the Midi, in the East,in the West, in the Centre, in France and abroad, it is the same indignant protest I gather from the mouths of the wives and daughters of workers: we are the victims of the lubricity of the males of the bourgeoisie and of the foremen”. Breaking with bourgeois feminism, she attacked the institutions of marriage and the family. In March 1906 the Courrieres Colliery disaster in northern France claimed the lives of one thousand, one hundred and one miners. In the outbreak of protest and the strike that followed, 2,000 anarchists and syndicalists led by the anarchist miner Benoit Broutchoux and by Sorgue converged on the town hall and attempted to storm it, but were beaten back by the police. In 1907 she was deeply involved in the strike of the women cheesemakers at Roquefort. This not only involved the appalling conditions that these women had to suffer, but the same sexual harassment that the women workers of Limoges had protested against. In 1908 she remained seated when King Carlos of Portugal entered the Lisbon International Peace Conference. He had her imprisoned at Oporto as a result. Thousands of workers demonstrated in Lisbon against this and the authorities then decided to expel her, sending her down the Tagus accompanied by a gunboat because a demonstration in her support was taking place in Lisbon. In 1907 and 1908 she took part in the mass movements in Northern Italy in Genoa, Milan, and Turin. She was invited to speak to a demonstration to be followed by a party for children of strikers in Milan. As a result of this she was arrested for apologising for regicide for calling for the assassination of Victor Emmanuel ( which she denied). She was acquitted but still had to serve a long prison sentence on the charge of anti-militarism! She headed the women's hunger march on Tower Hill in London during the 1912 dockers' strike. She also took part in the agitation during the Tonypandy strike. Many times she had to escape from hostile mobs. She was the only woman present at the 1910 Seamen's conference in Antwerp, speaking there for the French dockers. In 1911 she spent some time in Hull, during and perhaps after the June dockers’ strike, where she did much agitational work, endearing herself to many workers in Hull. There she was under considerable pressure from the ship-owners, merchants and the authorities. In this period she did much to popularise the new ideas of French syndicalism, speaking in Scotland, England and south Wales and supplementing the work of Tom Mann and the Industrial Syndicalist Education League. She visited Glasgow on several occasions where she addressed mass meetings. In 1914 she spoke at Ardrossan in Scotland alongside Ben Tillett and Joe Houghton during the dockers’ strike. With the outbreak of the First World War, she rejected internationalist positions and took one of “national defence”. In fact , from ferociously denouncing capitalist wars just a few months before, she like most of the insurrectionalists, including her husband and Hervé, transformed themselves into the worst ultra-patriots. This ruined her revolutionary reputation in the long run. The “Louise Michel Aveyronnaise” ( another of her nicknames) gave a speech on 18th June 1921 calling for the need to rebuild a bloc of the Left at Rodez in the Aveyron. The audience was not impressed. As one of them wrote, “Alas, everyone remarked that this was not our Louise. She much wanted to declare herself a socialist and syndicalist, very proud of carrying the flag of the miners’ federation but dropped a depth charge against the Russian Revolution”. She now spent most of her time in London and died there on 18th February 1924. She was found dead in bed at the Bonnington Hotel on Southampton Row, apparently of a heart attack. She had come on behalf of the Belgian paper L'Indépendance Belge to interview J. R. Clynes and Lloyd George. Would it be a vineyard? They are all called domain's.